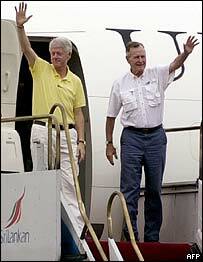 US ex-President George Bush Sr has praised his successor Bill Clinton for letting him sleep on their plane's only bed on their tour of tsunami-hit areas. Mr Bush, 80, told Newsweek magazine that the 58-year-old Democrat spent the night on the floor in the next room so that he could get a proper rest. Mr Clinton was respectful of his age and "that meant a great deal to me", the current president's father said. The two men made the trip last month to raise funds for disaster victims. Private donations resulting from the tour, which was undertaken on request from the White House, so far total around $1bn, Newsweek said. Both men said they were deeply moved by the experience. Mr Bush said the government Boeing 757 plane they travelled in had one VIP suite and another room with just tables and seats. "He decided ahead of time that we want President Bush to have the front room, which was heaven for me, because if I don't stretch out, lie flat, I really hurt my body these days ... [and] he was going to have the other room," he said. Mr Clinton could have switched places with him and spent half the night on the bed but did not, he said, adding that the next morning he found the 58-year-old sound asleep on the floor. "That was a very courteous thing," Mr Bush said, "very thoughtful, and that meant a great deal to me." The former president added that the two men had never been close, but always had a favourable opinion of each other, despite doing battle in the 1992 election. Mr Clinton had "rather pleasant feelings" about the current president, he said, adding that as a father, he found this "enormously gratifying". "I think it was good, because it sent a message to the world that these guys can fight like hell, have different political views and yet they can come together," he said.